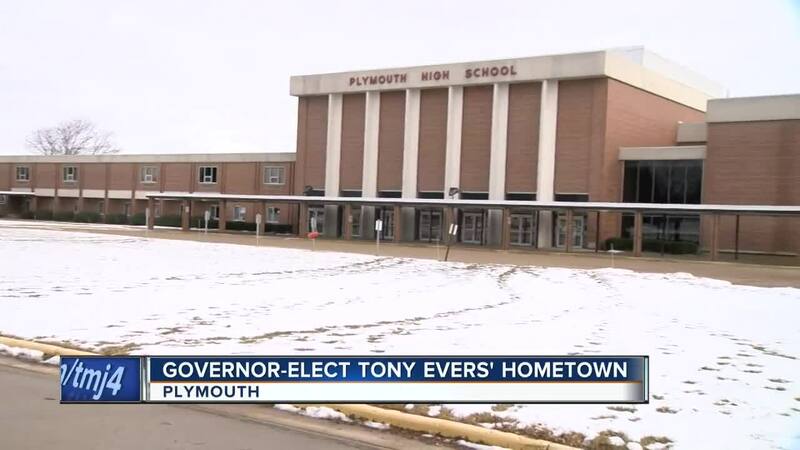 Evers, who currently serves as the state's Superintendent of Public Instruction, grew up in the Sheboygan County City of Plymouth. Governor-elect Tony Evers will be inaugurated Monday at a ceremony at the State Capitol in Madison. "It brings a sense of pride, obviously, that Governor Evers walked the same halls at Plymouth High School that I do every day," said 16-year old Alex Oty. On Monday night, Oty and the rest of the high school's German Band will play at the inaugural gala. "We're marching in to On Wisconsin and then playing a waltz for the Governor and his wife to dance to," the student added. Elsewhere in Plymouth, Kermit Krueger remembers a young Evers. "As a young man, he was a quality guy," he said. "All the people here that knew him are proud of him," Krueger added. He noted that's the case even among voters like him, who disagree with the Governor-elect politically. Judith Huebner, who's lived in Plymouth since 2000, said she and her neighbors pride themselves on the city being a warm and welcoming community. "It's nice. It's a small town with friendly people," Huebner said. Oty and his father, Alan, said they hope Evers brings some of those values to the Governor's office. "I'm looking forward to seeing what he does," Alan Oty said.